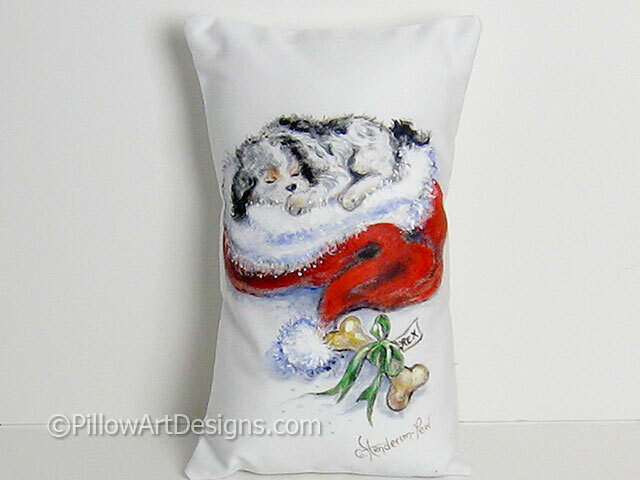 One of our Christmas hand painted mini pillows, this cute little accent features Rex the dog sleeping in a red and white Santa hat, a Christmas treat lays next to him with his name painted on the tag. 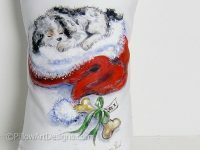 Original art by Canadian artist Carol Henderson-Pew, signed by Carol. Painted with quality paints, will not wash off, flake or rub off. Spot clean or hand wash in cold (remove stuffing), lay flat to dry. Comes stuffed with premium hi-loft polyester fiberfill.